Goalkeeper Tim Howard had a record-setting performance in the U.S. team’s knockout match against Belgium in the World Cup. In a knockout match in the 2014 World Cup in Brazil, American goalkeeper Tim Howard stopped goal after goal. 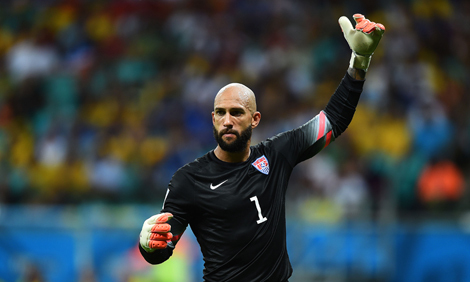 By the end of the match, he made 16 saves in America’s 2–1 defeat to Belgium. Despite his team losing the game, Howard got the record for the most saves ever by any goalkeeper in a single World Cup match. He was also named the Man of the Match. Howard is known as one of the best goalkeepers in soccer, which is called football in many countries. He plays soccer for the United States Men’s National Team (USMNT). He also plays for a club team in England. He started out playing professional soccer for Major League Soccer (MLS) in the United States, representing his home state of New Jersey. He first played for the New Jersey Imperials and then for the New York/New Jersey MetroStars. Starting in 2003, he began playing internationally for England’s Manchester United and then moved to the Everton club team in 2007. In 2013, he led Everton to a Football Association Challenge Cup, or FA Cup, win. Tim Howard was born in North Brunswick, New Jersey, in 1979. When he was a kid, his father bought lots of sports equipment for him and his brother to encourage their interest in sports. It worked, and Howard developed a love for both basketball and soccer. In high school, he was a star player on the soccer field, but he played the position of midfielder instead of goalie. He also averaged 15 points a game on the basketball court and led his high school basketball team to the state finals in his senior year. Known as a team player, Howard often leads the USMNT in the cheer “I believe we will win.” He also posts encouraging messages and photographs about his team on social media. He has won many awards for his playing and sportsmanship. He also won the MLS Humanitarian of the Year Award in 2001 for his work with children with Tourette’s syndrome. Howard was diagnosed with Tourette’s when he was in sixth grade. Howard is also an active member of Athletes in Action, a Christian organization that promotes strong leadership and good character in sports. Read an article about Tim Howard’s record-setting game. Watch an interview with Tim Howard. Which position does Tim Howard play in soccer? For what team does Tim Howard play when he isn’t playing for the USMNT?